The Thin Blue Line American Flag Phone Case is the best way to show support for the law enforcement while using your phone. 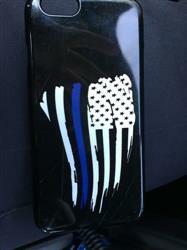 The unique phone case is designed with the Thin Blue Line and the American Flag. Do you know anyone who is a phone user 24/7? This is a great gift idea for any law enforcement officer! It's durable and can be used for an extended period of time. Show off your phone case and spread awareness of the sacrifices that our brothers and sisters in blue committed across the country.